Philip Patrick Cottrell was admitted to the Naval Academy from South Dakota on July 5, 1941 at age 21 years 3 months. He resigned on April 7, 1942 with the note: "Deficient in studies. Recommended to be dropped. Permitted to resign." Midshipman 4/c Cottrell in the 1943 Lucky Bag. 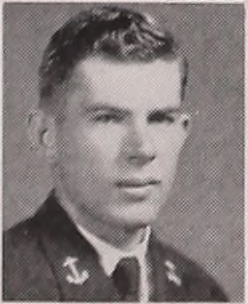 Philip Patrick Cottrell is listed among those classmates who did not graduate in June 1944 with the Class of 1945. Philip Cottrell was born on April 16, 1920, to Abigail and John Cottrell of Trail City, Dewey Country, South Dakota. Philip was enrolled at Black Hills Teachers College for a time and was subsequently appointed to Annapolis by Rep. Francis Case in 1941. Cottrell attended Annapolis for a time and then transferred to the Marine Corps aviation branch; he had earned his wings and commission in May of 1943 at Corpus Christi, Texas. Additionally, Philip was at one time the South Dakota Golden Gloves boxing champion. Lt. Cottrell was killed during a training accident while piloting a tow plane near Mohave, California, the local newspaper wrote. According to Lieut. James Seay, [his roommate], no one saw the tragic accident, hence details concerning it are not clear. The squadron had gone up about 2:30 p.m. to get in a couple hours of target practice. Phil was piloting the tow plane. When he attempted to let out the long target sleeve, it became entangled and wouldn't unfold. Having no target to shoot at, the squadron decided to go back to the base. Phil was to pull in the "sleeve" and follow them in. Apparently, the target was blown up against the side of the engine as Phil was hauling it toward the cockpit, and it became ignited. His plane afire, Lt. Cottrell had no choice but to jump. It is believed the fuselage of the plane struck him on the head as he leaped. He never pulled the ripcord. After ten hours of searching, Lt. Cottrell's body was found "on the side of a mountain, several miles from his shattered plane." His remains were returned to South Dakota, accompanied by Lt. Seay, and he was buried with military honors at the Greenwood cemetery. Philip Cottrell gave his life to bring an end to WW II, and was noted as being well-liked and highly respected. At the time of his death he was survived by his parents and a half sister Mattie. A different site has his death on a different date; believe this incorrect as the Find A Grave entry has a picture of his tombstone. Philip is one of 59 members of the Class of 1945 on Virtual Memorial Hall. This page was last modified at 15:54 on 22 March 2019.